Alec can offer a wide range of training, workshops, CPD sessions and talks to audiences of teachers, librarians, Early Years practitioners, parents, and others. Clients have included the School Library Association, school library services, CILIP’s School Libraries Group, public library services, local education authorities, museum services, the Civic Trust, and individual schools. Alec also works abroad, for organisations like the British Council and IFLA. Alec is particularly known for training on reading for pleasure, literacy and reader development, boys’ reading, school libraries, promoting reading, and library design. He also trains on storytelling, poetry and children’s books. You can download a list of available courses (PDF), but please ask Alec about other topics too! His frequent visits to schools (running storytelling and poetry sessions) keep Alec right up to date with best practice, in all aspects of library use and reading initiatives. Alec’s frequent work abroad also gives his courses a unique international perspective, showcasing ideas from around the world. A lifelong advocate of reading, Alec runs courses which are rich in humour, examples, extracts and anecdotes. It takes two! Alec rehearses a two-hander poem with students from Belfast’s Wellington and Aquinas schools in this shared education session. See Where’s Alec? to find out if he’ll be near your school soon. 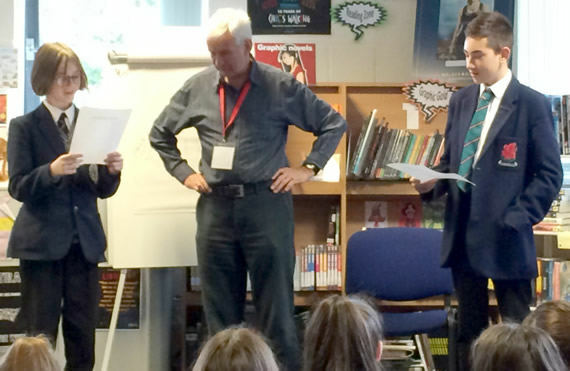 Alec's now Patron of Reading at three schools. Look at his Patron of Reading page to see how he's encouraging children at these schools to enjoy reading! Don't forget poetry! Here's Alec recently rehearsing children in a great read-aloud conversation poem. Thanks to Manorside Academy and Deep South Media.